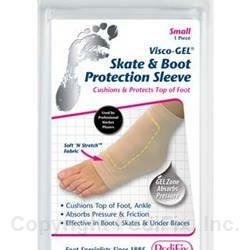 Visco-Gel® padding provides relief from pressure and friction in all types of boots and skates as well as under braces and splints. Soft ‘N Stretch™ fabric keeps gel padding in place without adhesives. Thin design fits comfortably in most footwear. Washable and reusable. 1 per pack. Slide on over foot and position gel pad on top of foot and lower ankle. Test for comfort, reposition as needed. Hand wash, rinse thoroughly. Press flat in towel to remove excess moisture. Air dry completely before reuse. Sprinkle with talcum powder if gel becomes tacky. Do not place over an open wound. If you have diabetes or poor circulation, consult your physician before using. If numbness, discoloration, irritation or additional pain occurs, discontinue use immediately. If symptoms persist, visit a foot specialist.